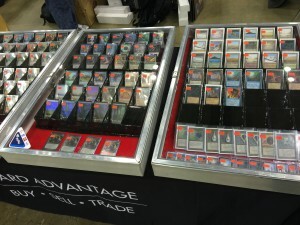 Depending on local player population, a vendor may have higher demand for certain cards. Perhaps there’s a strong Commander population locally. Or perhaps a shop runs successful Legacy events on a weekly basis. Other shops may have tremendous Standard turnouts. No matter the niche, this trend can evolve into interesting price differentials. One of my favorite ways to track these differentials is via the “Hotlist”. The Hotlist has become a mainstream strategy for a vendor to showcase the cards they are currently searching for with what they feel are higher-than-average buy prices. Used effectively, it’s an excellent way to draw wandering players at large tournaments while also filling voids in stock. One of my favorite stores – ABU Games – has had a Hotlist on their site ever since I started using them a few years ago. Whether or not those hot prices are truly competitive is a separate matter. Nowadays it seems you can’t visit a vendor’s booth without seeing a hotlist posted on a whiteboard somewhere. What’s more, these lists have started getting the attention of a broader MTG Finance crowd. Now I don’t even have to attend an event to monitor what certain vendors are actively chasing; I just watch my Twitter feed and each weekend the pictures come pouring in. Over the past couple weeks, I’ve noticed something I want to point out. From there, I want to deep dive into my hypothesis for why this trend has surfaced and wrap up with where I think it’s going from here. What I’m confused about is the Library of Alexandria movement up about $100, without any seemingly improved buylist prices. Correction based on demand or the same thing as tabernacle? After seeing CK briefly increase their buylist price to the same as retail a couple months ago ($350), i picked up a single HP copy for eventual vintage use and some no-banlist commander I play. I view it as every week there’s another person like me who has the funds for a truly high end reserve list card, and those numbers are slowly dwindling. Seeing a larger spike like that got me thinking that I need to ramp up purchasing power for a mox by the end of the summer. I’d say that’s an excellent goal and you are prioritizing wisely! The above captures an excellent point, and I’m glad to see I’m not the only one thinking Power is due for a bump soon. It’s perplexing I’ll give you that. My guess is it’s related to collectors. If you look, you’ll notice that nice condition copies of Library are much more expensive than played copies. This suggests to me it’s about collectibility more than anything. Tabernacle on the other hand is up across the entire board of conditions, which is impressive.